Colour is the fabric of the world. It is used by artists, illustrators, authors, actors, dancers and the media to portray emotions in a way that persuades the audience to respond in a certain way or that communicates the reality of the story. Colour speaks in a way that the spoken word can sometimes not, and is a powerful healing tool that is the study of some and overlooked by many. The power of colour is that it holds healing properties within it that resonates with different parts of the body at different times in different situations. This is because different shades of colour are a match for different emotions, feelings, states of mind and health and can be healing for the person just by wearing that colour. If the colour matches a chakra colour it is highly likely the Archangel attached to it is guiding you to heal any blockages and bring in a higher vibration of light. 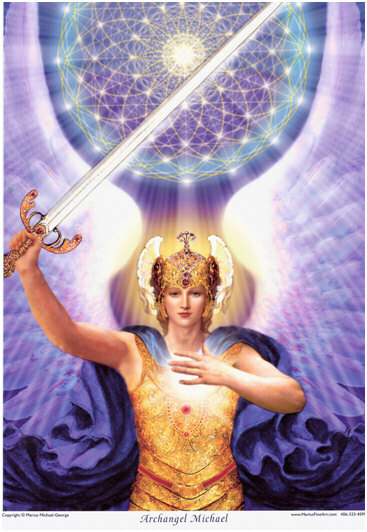 If you are a person who wears a particular colour most of the time it probably means you are working with a particular Archangel who is your constant guide for this period of your life. However, it is not necessary to be wearing the colour; you may see a colour often with your eyes open or closed or have an abundance of that colour in the garden or the furniture. I ask you to, for a moment, to consider the seven colours of the rainbow. The spectrum of colours within a rainbow rarely change when they appear, yet within each colour can many shades of that colour. These colours are all one and the same with the light and love of the Creator because they are, of course, fractures of white light and thus pure in essence. Each colour in the spectrum holds its own vibration of energy that resonates with one of the seven angelic rays, which are aligned to the chakras as well as to an Archangel. 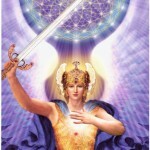 So, any colour that you are suddenly drawn to may be an indication that you are blocked in some way in that colour chakra and the angel aligned with it is the best one to call upon to help you to unblock that chakra and to release the emotional blockage that is causing fatigue, illness or pain. Bright colours are best to reflect vibrant health. Sombre colours will ground a person and make them feel responsible and business like, but if they are not in good mental health, wearing these colours regularly could lead to feelings of heaviness as well. This is possible because each chakra holds a pure vibration of light that, when at its highest and most vibrant, brings the person to experience feelings of health, wellbeing and perfect balance. The vibration of light within your being will be reflected in the colours you are drawn to wear and to keep around you. Take notice today of the colours in your life and to reflect on the state of your health and wellbeing.